Heat oven to 325°F. Grease bottom and sides of 13x9-inch pan with shortening and lightly flour, or spray with baking spray with flour. In 2-quart saucepan, heat corn syrup, 1/2 cup butter and 6 oz chocolate over low heat, stirring frequently, until chocolate is melted. Remove from heat. Beat in eggs, one at a time, using wire whisk. Add flour, granulated sugar and 1 teaspoon vanilla; beat with wire whisk until batter is smooth and shiny. Spread in pan. Bake 23 to 25 minutes or just until toothpick inserted in center comes out clean (do not overbake). Cool completely, about 45 minutes. Meanwhile, in large bowl, beat peanut butter and 1/2 cup butter with electric mixer on medium speed until blended. Add powdered sugar and 1 tablespoon vanilla; beat until smooth and fluffy. Spread over brownies. In 1-quart saucepan, heat whipping cream and 6 oz chocolate over low heat, stirring frequently, until chocolate is melted and mixture is smooth. Stir in 1 teaspoon vanilla. Cool 5 minutes. 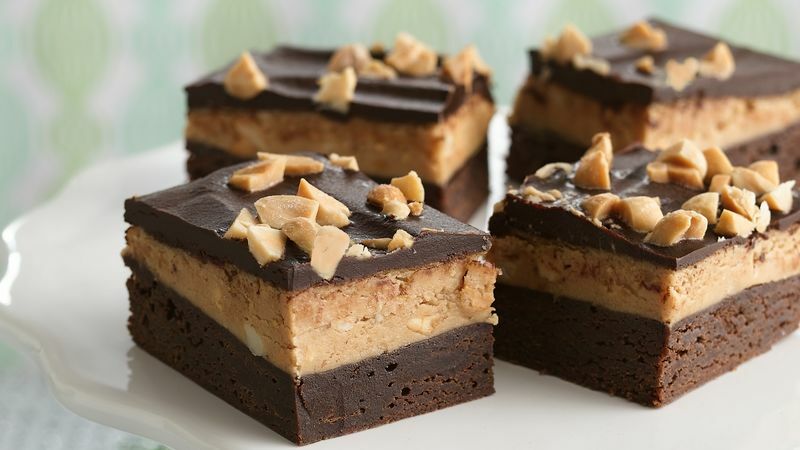 Spread frosting over peanut butter filling. Sprinkle with peanuts. Refrigerate until firm, about 1 hour. For brownies, cut into 6 rows by 6 rows. Coat your measuring cup with cooking spray when measuring corn syrup; it will pour out of the cup easily. To cut into bars, use a thin-bladed knife dipped into warm water.